The first piece of equipment retiring Sergeant Detective Kim Gaddy ’81 turned in was her radio. At that moment, she unexpectedly felt the gravity of parting with a piece of equipment that—for more than her three decades with the Boston Police Department—had proven so crucial to her work. 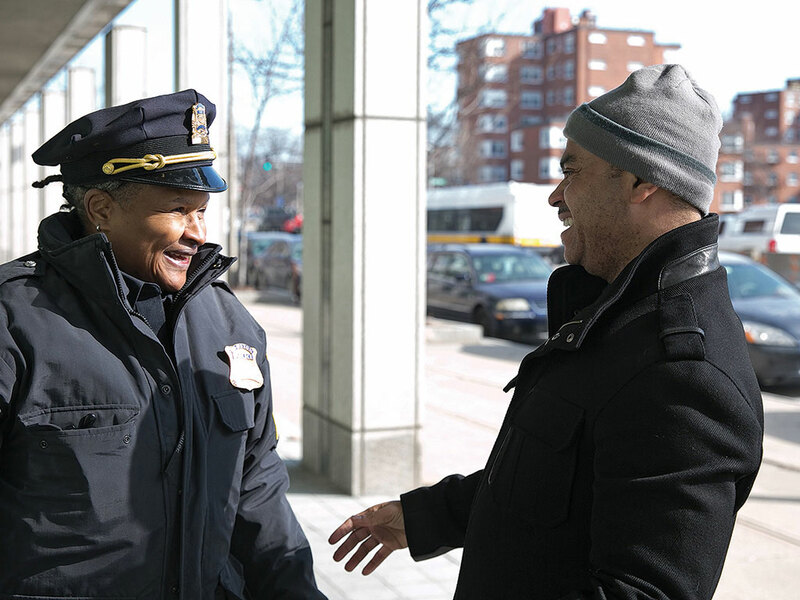 Gaddy stepped down on January 31 after a successful career on the Boston police force. An accomplished scholar, she currently is exploring the lives of the women who made her career possible, tapping into her love of research. As sergeant detective, Gaddy has investigated deadly assaults, stabbings, rapes and suicides. “I’ve seen things that people shouldn’t see and I’ve been to places where people shouldn’t go,” she said. But while she has responded to the worst of crimes, she has touched innumerable lives—and even helped save some of them. In 1986, she chased down a suspect who set a house on fire, and her call over the radio enabled other officers and the fire department to free the people trapped inside. “People thank me more often than criticize; it has been a very rewarding job. It has felt great to make someone’s life a little easier, safer and better,” she said. Other, less dramatic, experiences than the fire incident stay with Gaddy—and provide insight into how she views her work and the community she served. She still recalls a fatal stabbing from 30 years ago that happened after a heated card game at an apartment in the Franklin Field housing development in Dorchester, Mass. She arrived just as the EMT had removed the body from the scene. The un-air-conditioned apartment was stifling hot on a 90-degree day. A woman was mopping up blood on the floor. Gaddy noticed a light flickering in the backroom and went to look. “I saw a small TV and two filthy mattresses in the corner of the room. There were no sheets or anything like that, just piles of clothes,” she said. She spotted a boy sound asleep in the garments. “He must have been between 7 and 9—just a little boy—with his shirt off and wearing filthy underwear. He had slept through a homicide in his own home,” she said. The sight of him left an impression on Gaddy, who felt sadness for the child as she imagined his life stretching out before him. “There’s no way you can say that he is on an even playing field with other kids. And there are so many others like him—victims of crime. These kids start off at a deficit that you can’t even imagine,” she said. Such perceptiveness reveals Gaddy’s thoughtful nature as a scholar—an area in which she has distinguished herself over the years. Gaddy, who graduated from Wheaton with a double major in sociology and political science, received her master’s degree and doctorate in education from Boston University. She has lectured on the history of women in the Boston Police Department, including at the Massachusetts Association of Women in Law Enforcement conference at Wheaton in October 2017 and the Boston Public Library. In her retirement, she plans to dedicate more time to research. 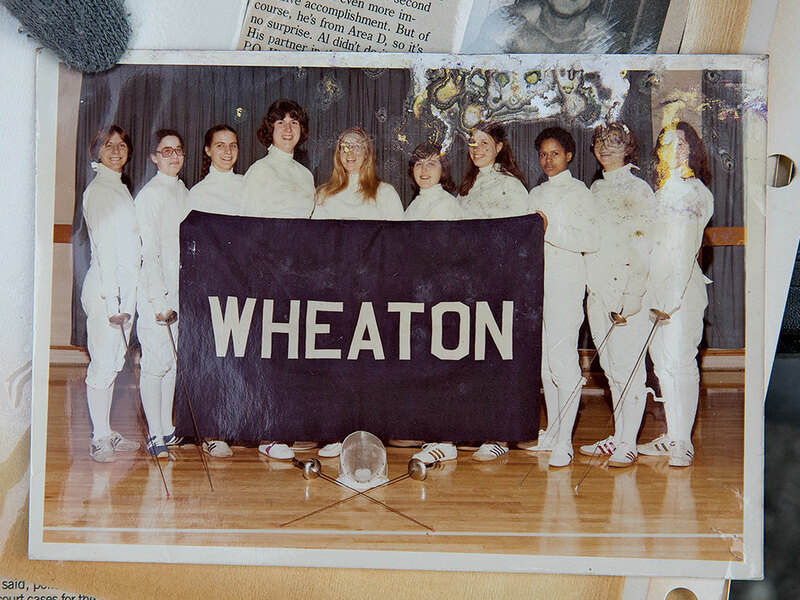 In 1981, as a new Wheaton graduate, Gaddy wasn’t sure what path she wanted to take. She enjoyed adventure (like the year she spent in Thailand while in high school) and adrenaline-fueled pursuits, including competitive fencing in high school and at Wheaton. After college, she craved more excitement—and found herself drawn to an advertisement in the newspaper for a police cadet program. With no family serving in the Boston Police Department (her mother worked in social services), she in many ways was embarking on uncharted territory. She took the cadet test and passed, and was assigned to work in the Office of the Police Commissioner. But she did not want to work in an office. “I told the director of the cadet program, ‘I want to be with the cops,’” she said. She pressed this point until she got a field assignment as a cadet in district two (Roxbury). She worked the 11 p.m. to 7 a.m. shift, and was the only woman there. “For me, as a young person who had pretty much been kept away from anything dangerous, it was extremely exciting. Anything could happen during the course of the night. Shootings, stabbings, you name it,” she said. In the years after becoming a police officer in 1985, Gaddy rose through the ranks. In 1992, she was promoted to sergeant, and when assigned to the anti-corruption unit, she was promoted again to sergeant detective. She later spent two years in the recruit investigations unit and eight years in the sexual assault unit. Now retired Sergeant Sheryll Pichon—the first black female promoted to sergeant at the Boston Police Department—first met Gaddy as a cadet. She said that Gaddy’s ability to speak up inspired many officers of color in the Boston police force who were hesitant to express their ideas. “She let us know that the door was open, that we had good ideas and could help develop policies. She became a mentor,” said Pichon, who credits Gaddy with encouraging her to launch a truancy prevention program. The confidence Gaddy developed as a Wheaton student helped her thrive, especially as a woman of color working alongside primarily white men, she said. Gaddy did. She railed back, shoulder first, and smashed the bathroom door open. She found the girl unconscious, but still breathing. “I did my job. They depended on me. I didn’t think a thing of it at the time, but afterward I thought, given how small I was compared to them, that was like a cartoon. But you just do what needs to be done,” she said. Gaddy worked the night shift for 20 years, and could get called out multiple times per night. She had four detectives assigned to her—so any time they got called out, she went as well. Her calls could take her anywhere in Boston. Living in the city’s Jamaica Plain neighborhood, it would take her less than 15 minutes to arrive on scene. No matter what awaited her, she was ready. Gaddy also worked in the anti-corruption unit investigating police officers involved in criminal activity—a challenging job that required her to be ready to stand up to any potential backlash from other officers. Her promotion to the anti-corruption unit—which was traditionally dominated by white men—was groundbreaking, Pichon said. Over the years, Gaddy has returned to Wheaton to share her firsthand experiences in law enforcement, meeting with students in the courses “Urban Sociology,” taught by Professor of Sociology Emeritus John Grady, and “Criminology,” taught by Professor of Sociology Javier Trevino. He welcomed the opportunity for students to hear a doctor of education and police officer speak from a broad personal and professional perspective. “She was especially good at clarifying what constitutes good police work and in identifying the challenges that police officers face. The students were very attentive, although the fact that she was wearing her service revolver may have put them on their best behavior,” Grady said. He particularly recalls her discussing how doing police work changes how you perceive the world. 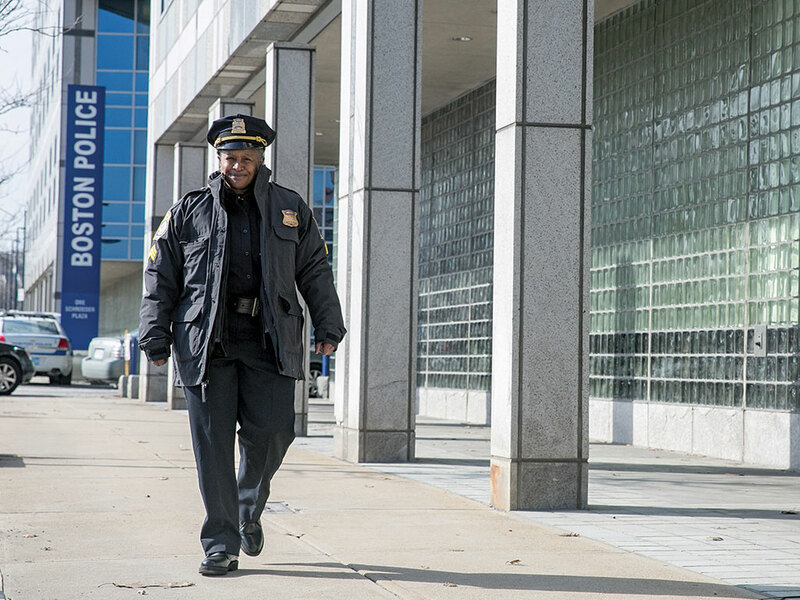 Gaddy has balanced her life in the Boston Police Department with the pursuit of knowledge. For her Ph.D. studies at Boston University, she researched compassion fatigue (indifference to the suffering of others due to repeated exposure) that affects some police officers. Margaret Sullivan, who worked as BU’s financial aid advisor and later joined the Boston Police Department as a records manager and archivist, commended Gaddy for her commitment to her education. “Many grad students were teachers who might get a sabbatical, or lighter load or have summers off while in school. A police officer does not and cannot refuse ordered overtime,” she said. Sullivan’s research into the first documented African American officer in Boston (circa 1878) piqued Gaddy’s interest. She approached Sullivan, seeking to document the early women officers appointed in 1921. Together they dug through city and university libraries for news clippings and photographs, and eventually pieced together a presentation. The duo presented their research at several venues, sharing interesting facts and photos of Boston’s first female police officers. The Boston Globe also reported on their findings in a front-page news story, and the late Mayor Thomas Menino exhibited images from their research at Boston City Hall. For Gaddy, her recent retirement is an ending but also a beginning. She now is conducting research for various police organizations, including the Massachusetts Association of Minority Law Enforcement Officers. 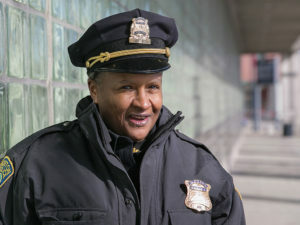 Her focus is on a wave of women of color recruits to the Boston Police Department during the 1970s, which occurred amid pressure from church and grassroots groups for a more representative force. “Associations want to hear about the research from someone who has actually experienced what it’s like to be an officer. I feel blessed and honored to be able to do this,” she said.